When I made some Ugly Cake Balls during my recent Week of Baking, I saved a couple for future experimentation: one with the white chocolate coating, another with no coating at all. This week I let my daughter make some gummies after having deprived her for the last few while making lots of gummies and gummy-related items for the related classes and events. She keeps seeing the letters I made for the book cover in the fridge and giving me giant-sad-eyes because I won’t let her eat them. Cue “It’s The Hard-Knock Life” for her now, please. She cast a couple of Chillbots and then an entire Ice Palace (see the Gummy Tutorial for how she did it). 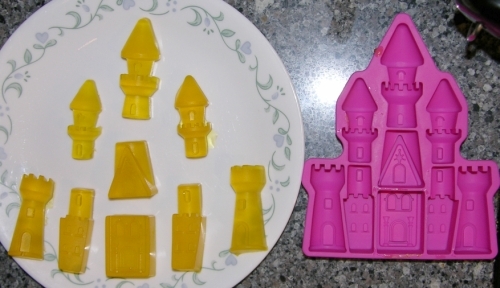 You can get a whole castle plus more out of one batch of standard gummy. But before she did that, I used a bit to see if you can cover a cake ball with gummy. The answer: yes. The qualified answer: yes, but I’m not sure if you should. 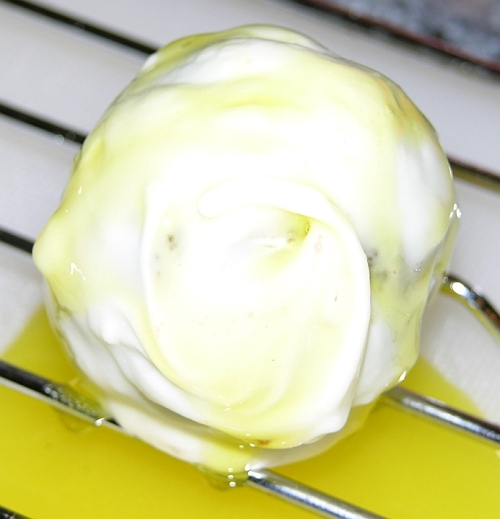 The first test was on the naked cakeball which was completely frozen for several days. I removed it right before coating, and held a paper towel around it briefly to remove surface moisture. Then I coated it in the gummy, which stuck well and fairly thick since it cooled immediately against the frozen surface. I deliberately chose one that had a bit of vanilla cake chunk showing so I could gauge the relative translucency. Yup. That's a gummy-covered cake ball. Then I drizzled some over the chocolate-covered cake ball. Because that one wasn’t frozen, it left a very thin coat as most of it ran off. Again, I deliberately chose the cake ball with the chunkiest coating so a) the gummy would have a place to sit, b) I’d be able to gauge relative detail through the coating, and c) this was the ugliest one so it was deemed more suitable for experimentation than sending to Corran’s workplace. The coating is so thin it's hard to see in places. 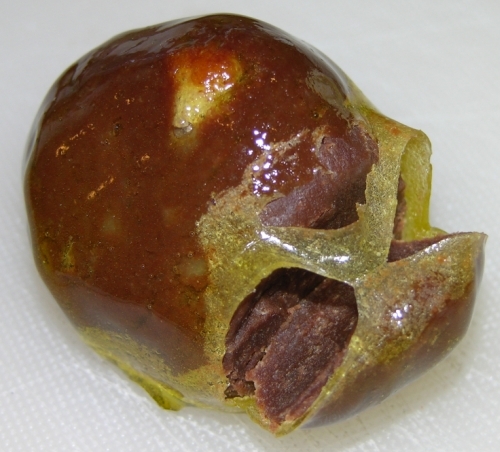 In both cases, the gummy went on without disrupting the surface of the ball itself. 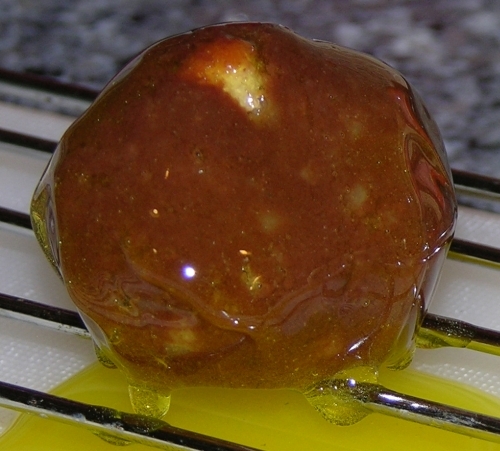 This means gummy can be added to a cake ball; just be sure to let the gummy cool enough that it’s not going to melt the chocolate coating, but not so cool as to be about to solidify. The slightest pull will take a fresh gummy coating off. The knife mostly cut through but pushed at the top, so it split further up the ball to come off unevenly. This means it’ll do likewise when biting into it. 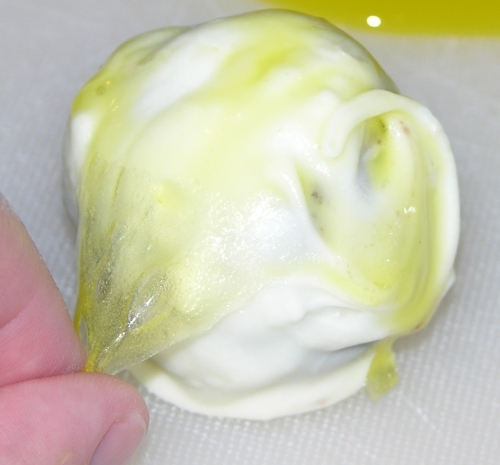 It will likely remain stretchy like this over a moist cake ball and not snap like chocolate. However, on the chocolate-coated ball, it did cut cleanly when allowed to dry. Therefore, you can coat cake balls in gummy, but over an uncoated ball you’ll get a chewy coating which I personally find somewhat undesirable (although it’s possible the right flavour combination might work). The colder your cake ball, the thicker you’ll get the gummy. There’s potential for interesting translucent designs over coated cake balls. I don’t make cake balls often enough to experiment but if you do, let me know and I might feature your experimentation and designs in a future post! Gummy castle nom nom nom. 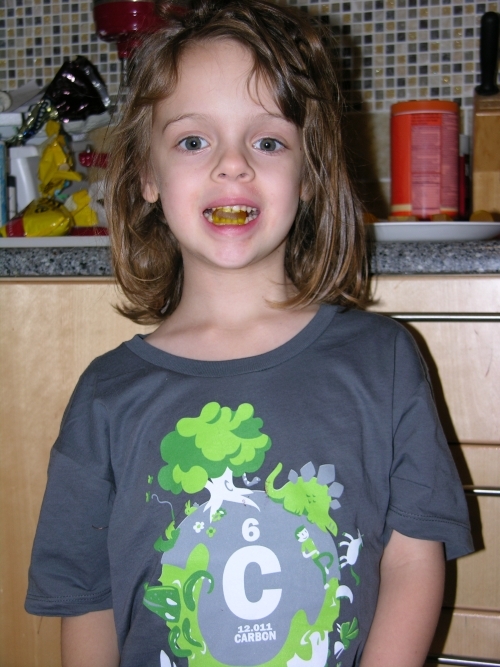 This entry was posted in Cake Balls, Cake Decorating, Experimental Techniques, Gummy, Products, Working With Kids. Bookmark the permalink. Incredible imagination and creativity! I just make cakes and that's it, I can't even decorate them properly! You're amazing! I'm following you from Rome!